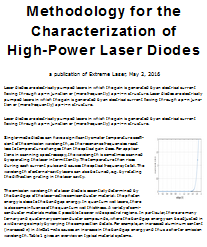 Abstract: The article discusses a scientific paper, reporting that efficient frequency doubling of long laser pulses in KTP is difficult. The reason is related an induced absorption (photodarkening) in the material. Frequency doubling can be efficiently performed either by intracavity frequency doubling in a continuous-wave laser, or with a Q-switched laser (intracavity or extracavity). It thus seems surprising what the paper cited above reports: frequency doubling with long pulses is difficult – at least at high power levels. When a high second-harmonic intensity is present for a longer time (hundreds of microseconds), the KTP crystal becomes absorbing. Apparently, temporary color centers are the origin of this photodarkening. The color center formation may be related to two-photon absorption. This explains why frequency doubling with nanosecond pulses works better. In continuous-wave operation, the situation should be even worse, as the color centers would have even much more time to build up. A solution can be intracavity doubling, where far lower optical intensities are required for efficient conversion: the non-converted infrared light is “recycled” in the laser resonator. However, intracavity doubling is limited in average power, as mentioned above. Of course, one may use a crystal material which does not have these temporary color centers. The authors reported slightly better results with LBO, but unfortunately without elaborating on damage and induced absorption. LBO is probably better in this respect, although it does need to be operated with higher intensities due to its lower nonlinearity. Even if damage is no issue, it is sometimes difficult to reach sufficiently high intensities with long pulses or in continuous-wave operation. So we see that frequency doubling long pulses (and in continuous-wave operation) can be problematic. The Spotlight article of 2007-03-05 explained why very short pulses are also involving difficulties – for entirely different reasons.